Whether you’re looking for tasty fried foods, take-out, or something you haven’t tried before, there are plenty of great places to eat in Kearney, NE. Below find our top restaurant picks! What Does Hassle-Free Pricing Mean? What’s Your Favorite Kearney Restaurant? Traditional American comfort foods like Surf ‘n Turf, burgers and fries, prime rib, mashed potato, Philly cheesesteak, and so much more are served with pride at this elegant, award-winning restaurant. Stop in for a quiet lunch, or enjoy the friendly, elegant dinner service at part of your date night activities. Just a quick drive from Grand Island, Suwannee Thai Cuisine offers the perfect balance of traditional and modern Thai cuisine. Sample spicy favorites like the Drunken Noodles, or play it safe with the crispy chicken. Either way, you’re guaranteed a great meal and friendly service. A top pick among residents and Lexington visitors who want authentic Mexican food in a welcoming, friendly atmosphere. Komal serves up perfectly spiced burritos, carnitas, and other dishes. Komal is perfect for those who like to control over the food they eat! Serving local produce and beef sourced from areas around Grand Island, Sozo is a favorite of locals and visitors. Sample mainstays like grilled steak and chicken, or opt for a seasonal dish and try something new to tempt your taste buds. We couldn’t finish this list without mentioning one of our favorite Kearney pizza joints. Dash specializes in gourmet pizzas topped with fresh, authentic ingredients, crispy, flaky calzones, wings, dips, and much more. And, if you need something to wash it down with, they even offer craft brews from some of the best breweries in the area. 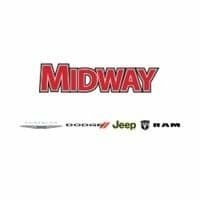 Explore Kearney, NE further with Midway! Did this list excite you, or are you looking for tasty bites closer to Grand Island or Hastings eateries? Let us know in the comments below and, if you’re looking for more suggestions about exploring the area, contact an associate at Midway CDJR today.